Even though the signal strength was quite a bit stronger than last week, I didn’t have as good decoding results. The images suffered from quite a bit of noise, especially the second one. The text items in the ever-resilient MFSK32 mode decoded with no errors, but the MT63-2000L mode item didn’t decode at all. I’m not sure it was entirely the fault of that mode because the signal dropped off to almost nothing just before the news item began. I manually switched Fldigi to MT63-2000L and the signal did recover before the end of the item, but no text was ever decoded. Radio Exterior de España was broadcasting on 17855 kHz this week, but there was no interference here to 17870 kHz. The signal was pretty strong here and the text (including the MT63-2000L item) decoded with no errors. There was some noise on the images, but I thought they decoded fairly well. Proving that you can’t really predict shortwave propagation, the signal this week was incredibly strong at my location. It is no exaggeration to say it was as strong as a local station, with only very occasional fading. 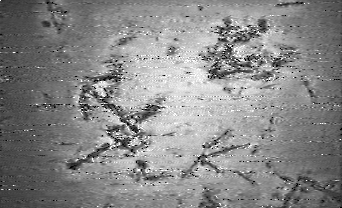 The news items decoded with no errors, and the images were among the best I have decoded from a VOA Radiogram broadcast. 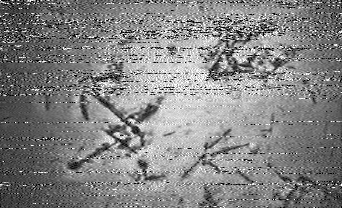 I’ve been trying for a while to successfully decode a VOA Radiogram broadcast entirely using an internet connected receiver, without much success until now. This week, I used GlobalTuners (free registration required) and picked a very nice radio operated by Terry EA5IHM from Bolnuevo, Spain. His receiver is a Yaesu FT-817 hooked to a Maldol HVU-8 Multiband vertical antenna. You can find out more about the setup on his web site. All the text items decoded with no errors, except for the MT63-2000L item which had a handful of one bit errors. I find the idea that I could control a radio located in another part of the world and use it to digitally decode a broadcast to be truly incredible. The image is Vincent van Gogh’s Portrait of Joseph Roulin. It is housed at the Kröller-Müller Museum, which is located not far from The Mighty KBC itself. I think it is safe to assume that van Gogh never imagined when he painted this in 1889 that it would one day be digitized and broadcast over shortwave.